Innovations in the flooring industry make it easy to achieve the perfect balance between beauty and functionality. If you are interested in a solution that guarantees to look and last the way you desire, consider laminate flooring. Laminate is a manufactured product designed to mimic the appearance of other high-end materials, such as stone tile and solid hardwood. Any option from our laminate selection guarantees to improve the appeal of your home, as well as the value. Whether you want to transform a space with a completely new style, or you are interested in matching existing décor, you are sure to find the ideal laminate in-stock at our store and showroom. The average household experiences wear and tear on a daily basis. To ensure your new floors hold up well far into the future, it is essential you choose a material that remains durable against all types of damage. 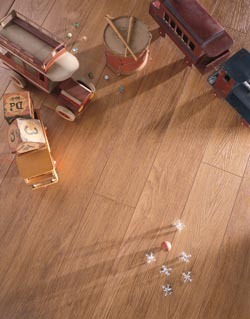 Just as important as the quality of the floor material is the quality of your laminate floor installation. When installed improperly, laminates may lose some of their strength and durability. This is why we back every purchase made at our location with the experience and skill of certified in-house installers. When it comes to laminate floor installation, rely on our team to perform the job in a timely manner, allowing you to start enjoying your new floors sooner than you ever thought possible. To further prove our commitment to the satisfaction of clients, we back completed installations with the Ultimate Confidence Guarantee. If you are unhappy with any aspect of the laminate surface, you are able to take advantage of the guarantee within 30 days of the initial installation. At this time, we replace the laminate with a comparable product free of charge. Laminate floors are available in a wide range of shapes, sizes, textures, and hues, making them uniquely able to satisfy the tastes of any homeowner. From rich and luxurious to simple and modern, we carry laminate in the most popular styles and colors. With so many laminate options to choose from, shopping may seem like a daunting task. However, our knowledgeable associates help you select the ideal laminate in a single, short visit to our store. To learn more about the laminate flooring from our store and showroom, call <PHONE> or stop by our location at your earliest convenience. We are proud to install laminate for clients throughout Sugar Land, Missouri City, Stafford, Fort Bend, and Sienna Plantation, Texas.